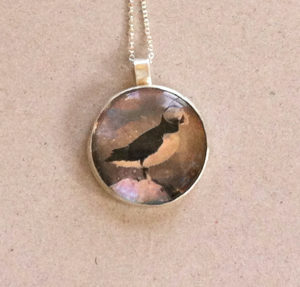 B/W photograph of a puffin on glass, with sterling silver bezel. The glass is 1.25 inch diameter, with the photo being printed on the back. Since all the glass pieces are the same diameter, I can prepare many sterling silver bezels of exactly the same size. The image above appears colored; this is due to ambient light being reflected from a piece of transparent dichroic film sandwiched between the photo and the back of the bezel. This film diffracts light at various wavelengths, depending on the viewing angle. Thus the print may appear bluish, yellow, or orange from different angles.